Situated in Southwest Uruguay, Colonia has a population of 26,000, and is the capital of Uruguay’s Department of Colonia. It was founded as a Portuguese port in 1680. Portuguese Colonia was directly across the Rio de la Plata from the Spanish port of Buenos Aires and threatened Spanish control of the region’s trade. For a century Colonia changed between Portuguese and Spanish possession through various battles and treaties until Uruguay’s independence in 1825. Colonia is a seductively picturesque town. 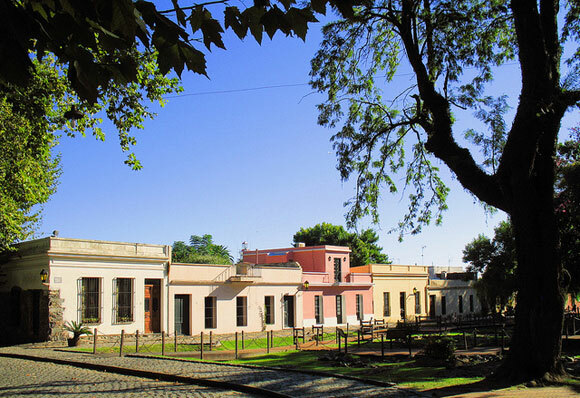 The original port community of Colonia del Sacramento is now a historic district known as Barrío Histórico. This is a six by eight block area was designated as a UNESCO World Heritage Site in 1995. Barrío Histórico has narrow stone streets with original Portuguese structures. There is a large plaza called Plaza Mayor, six museums, a large marina, restaurants. It is one of the most popular tourism destinations in Uruguay. But unlike much of coastal Uruguay, which is quiet in winter, Colonia is “open all year.” There’s a summer high season between December and March, but even in July you’ll find the nicer hotels booked solid on the weekends, especially with Argentines who find Colonia an easy and safe weekend getaway. 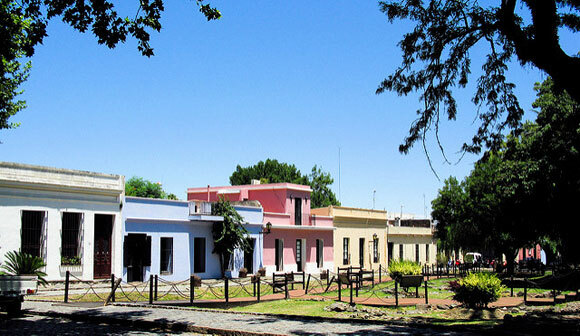 Many Argentines, in fact, have purchased vacation homes in Colonia, and many North Americans and English-speaking expats are also finding their way to Colonia. And it’s easy to understand why. As appealing as Uruguay’s beautiful coast is and as culturally exciting as Montevideo is, Colonia is special. Uruguayans have a knack, it seems, for getting the ultimate benefit from everything and from using things as long as they can—from old colonial houses to old cars, hand-me-down furniture and more. 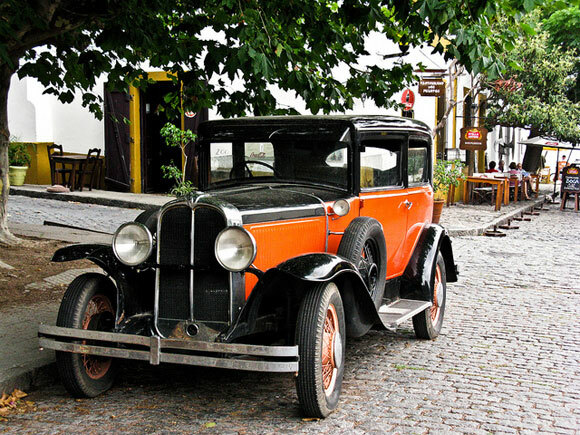 If you love antiques and connecting with the past, you’ll love the easy, Old-World charm of Colonia..
Colonia is located 28 miles across the river from Buenos Aires (a 50-minute ferry ride) and a two-hour drive from Montevideo, through the richly fertile farmland and vineyards. 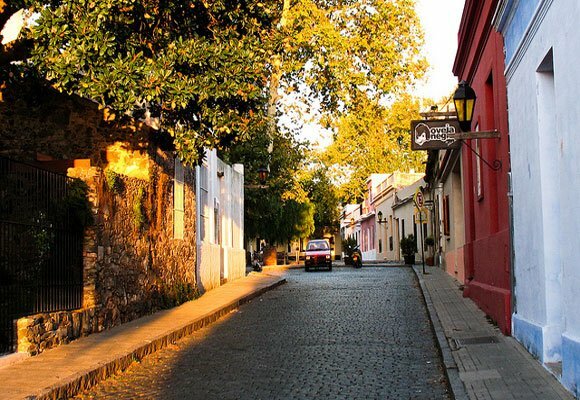 Barrío Histórico could be a scene on a picture postcard with its cobblestone streets, well-shaded sycamore-lined streets, restored colonial buildings, fine shops, galleries, and great restaurants. Colonia is famous for its fabulous sunsets. At night little tea lights twinkle in the trees of traditional restaurants…Uruguayan guitarists with romantically melodic voices serenade visitors as the wine flows…while you devour delicious freshly made pastas and Uruguay’s grass-fed organic beef. Many of the buyers and investors are Argentines who are investing in Uruguay’s economic stability and dollar-based real estate market. There are also growing business interests here. Besides being the location of the main ferry terminal to Buenos Aires, Colonia has a free-trade zone with a textile industrial plant and the Pepsi plant that makes soft-drink syrup for all of Latin America. In Colonia’s Barrio Histórico there is a two-bedroom two-bathroom house originally built in the late 1800s. It’s on a street made from cut granite paving stones with a sidewalk lined with sycamore trees. This historic home has been renovated with additions to make the home more functional. The add-ons include a guest suite and bathroom, a laundry room, and a storage room. The additions were designed and constructed in a way that preserves the lines and character of the original structure. Price $460,000. There is three-bedroom two-bathroom home for sale in Colonia’s Centro. It is just 100 meters from the riverfront and two blocks outside of the historic district. It is also on a street of cut-granite paving stones lined with Sycamore trees. This property has the charms of an older home as well as some contemporary touches. The home has a patio and outdoor area as well as a basement area with a bathroom. Price $300,000. A newer one-bedroom condo is for sale is on the rambla. It has a modern design with a wall of floor-to-ceiling windows, granite counter tops, and the latest fixtures. It also comes with a garage space. The building services included with this apartment is a sauna, gym, and indoor and outdoor swimming pools. Price $190,000. You can get a good bottle of wine for less than $10 in Colonia and in other parts of Uruguay, while you can get local grass-fed beef with no antibiotics or hormones for a small fraction of the cost of North America and other countries.